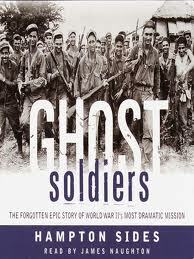 Ghost Soldiers Research Papers accounts for POW's during mission of Bataan Death March. Ghost Soldiers, by Hampton Sides, is an intense narrative of a seemingly impossible rescue-from-slaughter mission of Bataan death-march prisoners. The book is far more than a good read or an interesting narrative; it serves as an inspiration to anyone that reads the story of self-sacrificing, spirited men. The illustration that Sides sets up in showing how war turns men’s lives into simple liabilities to be expended yet causes other men to rise to incredible heights to salvage these liabilities. Hundreds of American POWs that the Japanese captured in 1942 had now gone from being considered a cheap source of hard labor to being a liability. On Puerto Princesa Prison Camp on Palawan, the Japanese decided to dispose of the POWs by moving them into a covered trench, pouring in gasoline and lighting it off to immolate the POWs. Any who struggled out were shot. But a small number escaped to the Filipino guerillas and carried news of the massacre to the oncoming Americans. Within a month, the Americans landed first on Leyte and then in Lingayen Gulf on the main Philippine island of Luzon. It is the tale of two massive POW campaigns that comprise Sides' book. He intersperse the story of April 1942, the month American resistance in the Philippines collapsed after holding up the invading Japanese for four months on the Bataan Peninsula, and the campaign to rescue prisoners in Cabanatuan. When the Americans and Filipino forces finally gave up on April 9, the Japanese figured they would only have to collect, house and feed about 25,000 POWs. The real number that threw down their weapons and stumbled out of the jungle waving white flags, was nearly 100,000, a number for which the Japanese were clearly unprepared. The POWs started their march north out of Bataan to their first prison, the pestilential Camp O’Donnell, spurred by the bayonet jabs of Japanese guards. Those already sick, emaciated men who didn’t keep up in what was to be called the Bataan Death March were shot, bayoneted or decapitated and left by the side of the road. Things didn’t get any better when the survivors reached Camp O’Donnell. Within two months 1,500 Americans and 15,000 Filipinos perished. One out of every 10 men who entered there died. Unbeknown to the POW’s, MacArthur was coming after seeing the far off flashes and the distant thunder of American ships hammering Lingayuan Gulf in preparation for invasion. Also knowing through the POW grapevine about the Palawan massacre, the POWs wondered when the Japanese would start slaughtering them, too. Marcus Junius Brutus - In spite of all the good deeds he had done, in spite of his genius in military matters, and in spite of his love for Rome and its empire, Marcus Junius Brutus will always be remembered for his participation in the stabbing of Julius Caesar. Beloved Analysis - A Beloved analysis essay discuss the novel by Toni Morrison, which tells the story of the haunting legacy of slavery and its impact on the present. Summary of Beloved - A summary on Beloved analyze Toni Morrison’s novel about a haunting tale of slavery and its impact on family relationships. All Quiet on the Western Front – All Quiet on the Western Front term paper on Remarque’s famous book reports on the human costs of war and is an anti-war novel. Paper Masters writes custom research papers on Ghost Soldiers and accounts for POW's during mission of Bataan Death March.